The Marsid M&M Group, a leading provider of printing, graphics, mailing and fulfillment services, is proud to announce the acquisition of Konica Minolta’s flagship full color digital press, the Accurio Press C6100. 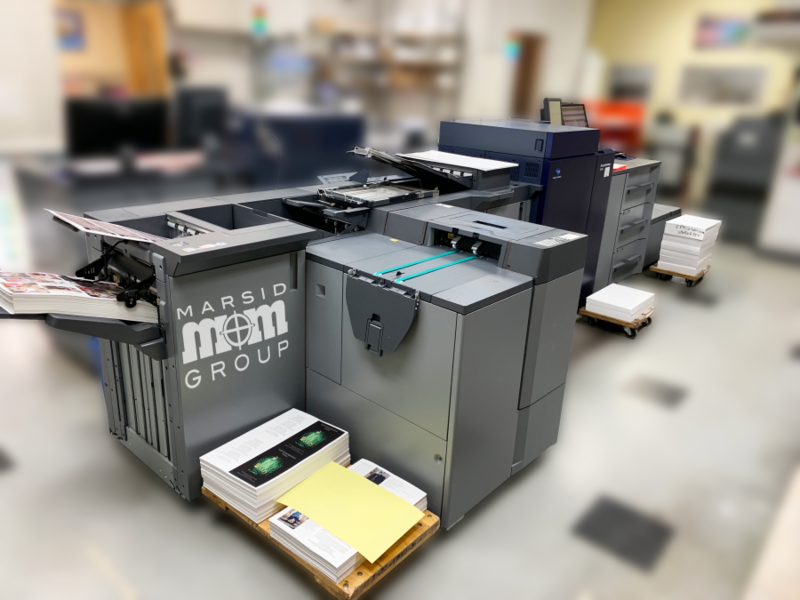 The new addition further solidifies the Marsid-M&M Groups’ commitment to the Digital Printing Market and Customer Demands for short-run, Variable Data and large format Printing. The Long Island based printing company will offer new paper sizes, faster output and efficiency to their nationwide customer base for all products including, but not limited to printing of 6 page brochures, catalogs, newsletters, annual reports, calendars, synthetic menus and digital business cards. “Our new Accurio Press C6100 will keep us “On the Top”; The Marsid M&M Group has been providing quality printed products to America for over 45 years. The installation of this state-of-the-art piece of equipment will insure that our clients will receive all of their products printed perfectly!” said Carin Walter, Production Manager at The Marsid M&M Group. The Konica Minolta Accurio Press C6100 presents a revolution in color digital printing with a staggering 100 full color pages per minute (6000 full color pages per hour) in an amazing 1200 DPI resolution to reproduce the finest detail in both images and text. Productivity and speed are only a small fragment of its capabilities. Complete with a on-board touch screen command center and the powerful CREO print management software, efficiency and quality are inherent. The Accurio Press C6100 is Konica Minolta’s flagship color digital press; it doesn’t get any better. 14 and 16-point heavyweight card stock can be fully duplexed while a pinpoint registration unit detects image skew and performs corrections on the fly. Exclusive Simitri HD+ toner – the world’s first polymerized toner particles – produce astonishing fine detail and color stability; a preferred attribute for any print professional. Besides the Accurio’s amazing color accuracy Konica Minolta has now invaded another section of the industry by being able to print up to 13”x30” sheet sizes digitally. This allows 6 – page brochures and newsletters, paper posters, and landscape booklets to be able to be printed in quantities as low as one. On top of it’s amazing printing capabilities it also has some the latest advancements on in line finishing. On top of being able to saddle stitch in line like The Marsid-M&M Groups bizhub’s; the Acurrio can also square back saddle stitch (Lay Flat Binding) in line. Brilliant and vibrant color with richer tones and higher resolution printed digitally on heavyweight paper at sheet sizes up to 13”x30”… The fine line between digital and offset printing just got thinner. To learn more about the Marsid M&M Group and their offerings, please visit www.mmprint.com or call 1-877-mmprint.